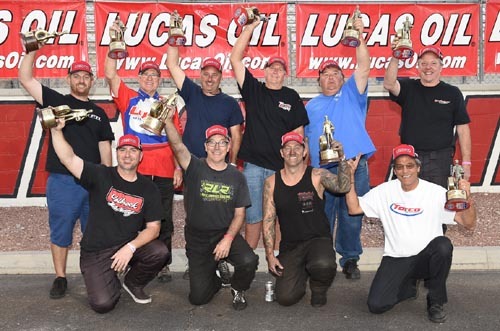 LAS VEGAS - Kim Parker and Chris Marshall took home the wins in Top Alcohol Dragster and Top Alcohol Funny Car this weekend at The Strip at Las Vegas Motor Speedway. Kahea Woods, Motorcycle. Not pictured, Kim Parker, TAD. Ed Olpin, TD; Joe Sorensen, Stock; Jeff Gillette, TS. Parker, Graham, Wash., qualified No. 1, then took out Dan Mercier and Johnny Ahten in rounds one and two to advance to the alcohol dragster final against Shawn Cowie who qualified No. 2. Cowie knocked out Matt Sackman and Duane Shields on his way to the final. Parker was out first as Cowie shook the tires and Parker led from start to finish clocking in at 5.604 seconds at 259.21 mph for her second regional event win. Marshall came from the No. 4 spot and advanced to the funny car final with wins over 2017 World Champion Shane Westerfield and Jirka Kaplan. Ulf Leanders of Sweden took out Steve Burck and John Lombardo Jr. on his way to the final. Marshall, McMinnville, Ore., took the holeshot and needed it to hold off the quicker Leanders. Marshall went 5.473 at 268.01 to defeat Leanders' 5.453, 268.01. Brian Hyerstay and Pete Peery took home the trophies in Comp and Super Stock respectively. Hyerstay put Tony Mandella on the trailer while Peery won over Justin Lamb who had just clinched the 2018 Super Stock World Championship earlier in the day. In the division's Top Dragster and Top Sportsman classes, Ed Olpin beat Steve Casner and Jeff Gillette won over Paul Mitsos. Rounding out the winners were Joe Sorensen in Stock; Matt Woodard in Super Comp; Chris Cannon in Super Gas; and Ryan Herem in Super Street. In the Sportsman Motorcycle class, it was local runner Kahea Woods out of Las Vegas taking the win over Eric Jaquith.